Black Ice Software - ONCE A YEAR OPPORTUNITY! ONLY 13 DAYS LEFT! Black Ice Software - Happy Holidays from Black Ice Software | ONCE A YEAR OPPORTUNITY! ONLY 13 DAYS LEFT! ONCE A YEAR OPPORTUNITY! ONLY 13 DAYS LEFT! Time is running out fast! You only have 13 days left to take advantage of our Annual Holiday Discount of 25% off all new purchases for all of our products! This applies to the Document Converter Printer Drivers, Document Converter Server, TIFF Viewer, BiBatchConverter, Print2RDP, Auto-print SDK and many more throughout the entire month of December. This Special Holiday offer will only be available until December 31, 2017. Be sure not to miss out on this limited time offer! The discount applies to new purchases only. Visit the Development Tool Store for Document Converter Printer Drivers and Development tools. Visit the Impact Product Store for the Tiff Viewer, Document Converter Server, BiBatchConverter, Print2RDP, Print2Email, and Fax products. 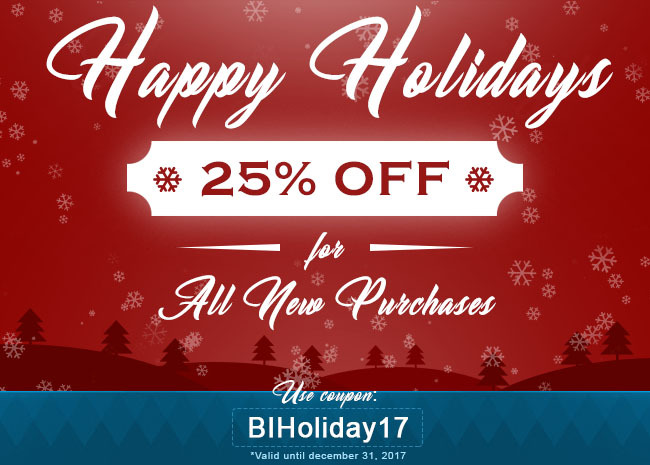 Take advantage of this valuable offer now by entering the coupon code BIHoliday17 during checkout or contact our sales office at sales@blackice.com.